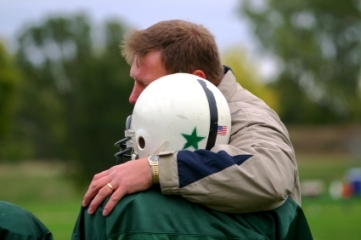 According to a number of recent studies [1,2,5,13,18], while the culture of sport (including influences from professional and other athletes), as well as the media and other outside sources play a role in the decision of student-athletes to report experiencing concussion symptoms, it is coaches and teammates, along with parents, who have the strongest influence on the decision to report a concussion during sport participation, with coaches being one of the primary barriers to increased self-reporting by athletes of concussive symptoms. value winning over safety, so much so that they are willing to risk the health of their "star" athletes for the sake of team success by employing a double standard when it comes to concussion safety - one for regular players, another, more lienient one for "stars" - which helps them justify putting a key player who has been "dinged" or "had his bell rung" back into the game. A 2012 study of Canadian college hockey players  found that many coaches downplayed symptoms in an effort to get an athlete back into action, ignored the team physician's concussion diagnosis and recommendation that a player sit out, resisted treatment of suspected concussion, and even intimidated physician observers. The problem, as Paul S. Echlin, M.D. of the Elliott Sports Medicine Clinic in Burlington, Ontario, Canada and author of the Canadian study, points out, is that the "young athlete is often caught between competing demands of the adults around them" and "sometimes make decisions based on the adult whom they perceive to have the most influence on their success, and also whom they wish most to please for a variety of reasons." In many cases, the coach is that adult. Echlin's comments are echoed in the findings of a 2013 quantitative study focusing on what drives the attitudes of high school athletes  towards reporting concussions ("attitude study"), which found that coaches and teammates are the strongest influences on an athlete's intention to report concussion. Although the study did not survey parents, the student-athletes surveyed "indicated that what their parents thought about reporting was an important social factor when deciding to report concussive symptoms"). Like the Canadian study, the attitude study by researchers at WakeMed Health and Hospitals, Raleigh, NC, the University of North Carolina at Chapel Hill, and A.T. Still University in Mesa, Arizona found that "the motivations and aspirations of coaches, parents, and teammates often compete as athletes value each of these groups' opinions." The reality is "there are still coaches and parents who have an old-school mentality regarding concussions. Pressure to play needs to be taken off kids in order for them to feel comfortable reporting their signs and symptoms of a possible concussion," says Tamara Valovich McLeod, , PhD, ATC, FNATA, Professor in the Athletic Training Program and Directors of the Interdisciplinary Research Laboratory and Athletic Training Practice-Based Research Network in the Department of Interdisciplinary Health Sciences at A.T. Still University in Mesa, Arizona, co-author of the attitude study, and lead author of an earlier study  on attitudes on concussions among high school students. The findings by Register-Mihalik, Valovich McLeod and their colleagues also echo the findings of a 2013 qualitative study of high school athletes in Washington State  reporting that coaches play a "pivotal role" in determining whether athletes reported concussive symptoms. Regardless of sport or gender, many athletes, found researchers from Seattle Children's Hospital and the University of Washington, "felt that they were expected to play injured. Unless the coach made it clear that an athlete needed to report symptoms of concussion, it was perceived to be unacceptable to come out because of a 'headache' or 'dizziness' [because] athletes did not want to be wrong about being concussed and suffer negative consequences" such as being punished by the coach for reporting concussive symptoms "by removing them from a starting position, reducing their future playing time, or inferring that reporting concussive symptoms made them 'weak.'" Most recently, a 2014 study  found that the attitudes and behaviors of coaches of university-level teams in Canada may have discouraged athletes from reporting concussion symptoms at the time of injury, with a third of athletes admitting to have suffered a concussion saying that they did not reveal their symptoms out of fear that being diagnosed with a concussion would affect their standing with their current team or future teams and nearly one-fifth because they feared such a diagnosis would result in negative repercussions from the coach or coaching staff. Why do such attitudes among coaches and parents persist, who's to blame, and more importantly, what can be done about it? A lot has to do with the pervasive "warrior mentality" of contact and collision sports, but parents and coaches also point fingers at each other. Nearly half of all coaches in a 2012 survey by SafeKids Worldwide   reported being pressured by parents, or the kids themselves, to play an injured child during a game, with the most notable pressure coming from parents, and being directed towards paid coaches, demands which may be hindering coaches' ability to keep player safety as a top priority. For their part, fully half of parents with children age 12 to 17 playing school sports admitted in the same 2012 survey to knowing a coach who returned a player to sports too soon after a concussion, althought it is unclear whether such coaches did so as a result of a win-at-all-costs attitude or due to a lack of education about concussion, since an alarming half (52%) of all coaches in the survey reported holding the mistaken belief that there was an acceptable amount of head contact (ie. getting their "bell rung", seeing stars) young athletes could sustain without potentially causing a serious brain injury. Most worrisome was the fact that the percentages of those who felt this way was highest among younger coaches under age 35, male coaches, and paid coaches, and was despite the fact that 9 out of 10 coaches knew that most concussions occur without a loss of consciousness . That many players (and presumably coaches) continue to downplay the seriousness of concussive events by labeling them 'bell ringers" or "dings" was highlighted in a 2013 study   by the same group of researchers at WakeMed Health and Hospitals, Raleigh, NC, the University of North Carolina at Chapel Hill, and A.T. Still University in Mesa, Arizona involved in the attitude study ("reporting study"), which found that a disturbingly low 13% of the high school athletes surveyed admitted to reporting events they considered bell ringers, most but not all of which were likely concussive injuries. The study also found that many athletes indicated only moderate agreement with the statement that concussion symptoms were serious, and many believed reporting concussions to be somewhat embarrassing. Along with their companion study finding that the attitudes of coaches, teammates and parents were the strongest influencers of reporting behavior by student-athletes,  these findings led study author Johna Register-Mihalik, Ph.D, LAT, ATC, Senior Research Associate at WakeMed Health and Hospitals in Raleigh, NC, and her colleagues to recommend more concussion education for athletes, parents and coaches about the signs and symptoms of concussion (including not just the most common athletes experience, such as headache and dizziness, but those experienced less often, such as nausea and amnesia), the serious nature of concussive injuries and the need to report bell-ringing events that might be considered so 'mild' that they go unreported. In addition, though, because they recognized that "knowledge alone does not equal behavior," and that "individuals may understand and believe that concussion is a serious injury and even a medical concern" but they may still not report the injury "if they also believe that their peers or coaches will take issue with their reporting their injury or that they may lose substantial playing time," Register-Mihalik and her colleagues also called for steps to be taken to "create an environment that rewards positive concussion-care seeking behaviors such as reporting an injury or removing one's self from play when experiencing concussive symptoms." They offered as examples of steps that might be taken to create a safe concussion reporting environment having the athletic director at the school bringing in medical providers from the community to talk about concussion, and a coach being understanding and supportive when an athlete reports concussive symptoms and is unable to continue playing, especially in front of other athletes." In addition, "parents play a key role in driving coaches to be aware and to create this environment at home," Register-Mihalik said in an interview with MomsTEAM's Lindsey Barton Straus. Concussion education of coaches and the creation of a safe reporting environment, said the concussion reporting study, is particularly important given the role the coach often plays in initiating medical care in the event an athlete is injured; the fact that, while coaches do not have the same training as medical professionals and reporting to a coach is admittedly very different from reporting to a medical professional, coaches are often the authority figure to whom individuals turn to report a concussion or other injury; and the reality that less than half of all U.S. high schools have access to a certified athletic trainer. As Register-Mihalik wrote in the attitude study, "the coach-athlete is unique as the coach has a large amount of control over athlete participation in games/practices. Given that losing participation is a deterrent to reporting, it is logical to expect [those, like coaches, teammates, and parents] who influence participation to have some influence on concussion reporting among athletes." "Conforming to a coach's belief system on the athletic field," she notes, "is common among athletes." That a recent study suggested that coach listening and support may play a role in recovery from injury, Register-Mihalik argued, highlighted further the importance of coach opinion and support. Unless the coach made it clear that an athlete needed to report symptoms of concussion, it was perceived as unacceptable to come out because of a 'headache' or 'dizziness.' Athletes did not want to be wrong about being concussed and suffer negative consequences. The coach could punish them for reporting concussive symptoms by removing them from a starting position, reducing future play time, or inferring that reporting concussive symptoms made them 'weak.' Coaches thus had an important role in facilitating concussive symptom reporting. Athletes relied on their coaches for guidance regarding which symptoms to report and whether it was acceptable to stop playing. Another 2013 study, this one assessing the effectiveness of the NCAA general concussion education mandate  among Division 1 male hockey players  likewise found that concussion education which simply focused on educating athletes about concussion symptoms was ineffective, because it did not address what is increasingly seen by concussion experts as the root cause of underreporting: the negative attitude of coaches towards concussion symptom reporting by players. "The ineffectiveness of the existing educational materials in changing relevant [attitudes], and the low rate of recall for many modes of delivery [of concussion information] is not surprising given the didactic focus on symptom identification and reporting," writes lead author Emily Kroshus of the Department of Social and Behavioral Sciences at the Harvard School of Public Health. Such focus, she wrote, "may be constraining concussion education effectiveness in changing reporting intention and behavior. The importance of targeting cognitions other than just concussion identification is reinforced by the largely volitional reasons given by participants ... who believe that they sustained a concussion during the previous season but did not report it." Kroshus and her colleagues viewed their "findings of a significant association among knowledge, attitude and subjective norms and concussion reporting intention [as] reinforc[ing] the importance of these cognitions as targets of concussion education," and as further support for consideration, when designing programs to modify concussion reporting behavior, not just of player attitudes towards reporting, but what they perceive to be reporting norms and attitudes towards reporting by others, as recommended by Chrisman in her earlier 2013 study. So what steps need to be taken so that a youth sports coach becomes part of the concussion solution, instead of continuing to be part of the problem? teaching proper tackling technique in football: A recent NATA study  shows that high school football players are at greater risk for concussive events in part because they haven't learned proper tackling technique ; a controversial 2013 study   also points to the need to teach younger players proper tackling, arguing that reducing the amount of time spent in full-contact drills during practice may lead to more concussions during games, but a subsequent study  found that the amount of contact during practices - as has been mandated by Pop Warner - does not result in higher impact exposure during games. teaching hockey players how to brace for and absorb body contact , as recommended by expert groups, like the American Academy of Pediatrics, as a way to reduce the risk of brain injury. As MomsTeam blogger and longtime Minnesota hockey coach and official, Hal Tearse, puts it, "Coaches need to do a better job of teaching players the right way to body check and how to absorb contact. It cannot be taught in a two-day clinic; it needs to be an important part of regular practices, and consistent messaging from coaches to players is required. The language we use needs to change, Instead of 'hit him', maybe words like "zero gap', 'take him', or 'box him/her out' might be better. Language is a funny thing in that words have power and meaning beyond what might be intended. Coaches need to choose their words carefully with young people." Learn about the signs and symptoms of concussion. Coaches need to know the signs and symptoms of concussion , so that, in the event there is no certified athletic trainer  on the sideline (as is the case in at least 40% of U.S. high schools and in the vast majority of youth and middle school sports contests), they can remove a player from the game in order to for a sideline assessment. Know how to conduct a brief sideline assessment. In the event no athletic trainer, team doctor, or other trained health care professional is on the sideline, coaches need to at least know how to conduct a brief, removal-from-play concussion assessment . There are a variety of courses coaches can take to learn about concussions, including a free on-line course  developed by the National Federation of State High School Associations in cooperation with the Centers for Disease Control and Prevention (CDC), in which coaches can learn how to recognize a suspected concussion, the proper protocols to manage a suspected concussion, and steps to help players return to play safely after experiencing a concussion, and the CDC's own "Heads Up" concussion kit for coaches . Coaches need to understand the importance of reporting concussion. The finding of two 2013 studies - one quantitative (data obtained from a large group of athletes answering questionnaires) and the other qualitative (e.g. evaluating athletes' responses to questions and hypotheticals in focus groups) show that coaches, along with teammates and parents, strongly influence concussion reporting behavior. Their findings "illustrate the need for educational programmes targeting [these] ... groups," says the author of the quantitative study, "to emphasize the importance of reporting possible concussion." "Given the coach's pivotal role in ... determining whether athletes reported concussive symptoms, interventions could be designed that focus on coach facilitation of symptom reporting," writes Sarah P. Chrisman, M.D., M.P.H., lead author of a 2013 focus group study which identified the attitude of coaches as the most significant barrier to concussive symptom reporting. Chrisman noted that while some concussion laws  require concussion education of coaches (a review conducted by a Temple University law school professor of the 45 concussion laws in place by the end of 2012  - a number that has since risen to 48 plus D.C. - found that only 25 explicitly require coach education in recognizing the symptoms of concussion and traumatic brain injury (TBI) in youth sports), "such education is designed to increase concussion knowledge, not to increase the likelihood that athletes will report symptoms." (emphasis supplied). While a 2010 study  found that 38% of coaches who ordered the CDC "Heads Up" concussion kit made changes in their prevention and management strategies, the fact that Chrisman's focus groups found coach's attittudes to be the biggest barrier to concussive reporting fully a year after Washington State's groundbreaking Lystedt Law  went to effect requiring concussion education of coaches, illustrated, she said, the need for a different kind of coach education to "address communication with athletes regarding when and how to report symptoms, protocols for athlete assessment, and ... to improve approachability." That such education can help has been reported in a number of studies. Actively, consistently and repeatedly encouraging honest self-reporting  by athletes of post-concussion signs and symptoms , both their own and those of their teammates (such as by employing the same kind of buddy system football programs often employ to protect athletes from heat illness during hot weather practices and games). Athletes in the 2013 concussion attitude study  reported moderate agreement with the statement that "I expect my coach to place a lot of pressure on me," and "people who are important to me think I should not report." Similarly, many athletes in the 2013 focus group study  reported receiving negative messages from coaches about injury reporting, with one football player saying that his coach told him that if had to come out on the field to take him off, "there better be a bone sticking out." indicating they are symptom-free so that they can be cleared to play in the next game when they are actually continuing to experience symptoms. State concussion laws need to be strengthened to penalize coaches who fail to create a safe concussion reporting environment and knowingly allow or encourage players to continue playing with concussion symptoms. Currently, only Pennsylvania  and Connecticut  penalize coaches for failing to remove a player with signs or symptoms of concussion or who allow a player to return to play without medical clearance in violation of their concussion safety laws, with the Keystone State requiring suspension for remainder of season for the first violation, suspension for remainder of the season and next season for a second offense, and, permanent suspension from coaching for a third violation, and the Board of Education in Connecticut empowered to revoke the license of a coach who violates the removal and return to play mandates. Some recommend going even further. As Coach Bobby Hosea told a group of high school players during the filming of "The Smartest Team, " coaches "need to put safety first. If they don't, they should not be allowed to coach. Period. Not suspended for the season. Barred from coaching for life." In the final analysis, argues Echlin, the author of the 2012 Canadian study on concussion reporting and attitudes in boy's hockey, "A change in the culture of sports concerning the seriousness of brain injury is fundamental to reducing the incidence of this type of injury, and to improved identification and treatment." The challenge is a daunting one, Echlin observes, because there is a "social resistance to change concerning concussion identification and treatment" (or what a 2014 Institute of Medicine/National Research Council report  on concussions referred to as a "culture of resistance") which will hard to overcome, even with significant efforts to educate teams and improve their care." Register-Mihalik struck a slightly more optimistic tone: "We are certainly seeing changes at many levels of sport in the right direction, but still have a long way to go." Register-Mihalik told MomsTEAM. "I do think there are things we can continue to do in the here and now that will result in immediate effects, especially when local individuals are advocates for concussion education and sport safety. However, it is true that historically culture change does take years." "One approach ... is to start at the youngest ages of sport so that individuals carry good attitudes about sports safety and concussion throughout their lives. It is also important that, in addition to this bottom up approach, that we have things trickle down from the top so that information is flowing in both directions, creating a more comprehensive safety network across sport." "Now that we have many people attentive to concussion, we need to make sure the right message is getting to the right people, in communities of all types. This involves community networking including parents, coaches, administrators and medical professionals at the local, state, regional and national levels working together," Register-Mihalik concluded. For their part, the authors of a 2013 study  assessing the effectiveness of the NCAA's general concussion education mandate, said what was needed, "more than the bare minimum of passing out a symptom sheet and saying a few words," was for a team's coaches and medical staff to "foster a culture of safety and reporting through other formal and/or informal means, and for evaluation efforts to "simultaneously assess coach and team medical personnel knowledge, attitudes and communication with athletes about concussions and determine how factors related to coach and medical staff [vary] with education content, delivery and effectiveness." The Institute of Medicine committee responsible for the IOC's 2014 report on sport-related concussion  was encouraged by the Chrisman  and two Register-Mihalik studies [1,5] finding that greater athlete knowledge about concussions and more favorable attitude toward reporting possible concussion was associated with increased reporting prevalence of concussion and "bell-ringer" events in these youth. At the same time, it recognized that "reporting intention may not always be an indicator of what an individual's actual concussion reporting behaviors will be," citing the three studies as suggesting that "future concussion education initiatives should focus on improving attitudes and beliefs about concussions among athletes, coaches, and parents." 1. Register-Mihalik JK, Linnan LA, Marshall SW, Valovich McLeod TC, Mueller FO, Guskiewicz KM. Using theory to understand high school aged athletes' intentions to report sport-related concussion: Implications for concussion education initiatives. Brain Injury 2013;27(7-8):878-886. 2. Echlin PS, Editorial. A prospective study of physician-observed concussion during a varsity university ice hockey season. Part 1 of 4. Neurosurg Focus 2012;33(6):E1 (published online ahead of print)(accessed December 10, 2012). 3. Valovich-McLeod TC, Schwartz C, Bay RC. Sport-related concussion misunderstanding among youth coaches. Clin J Sport Med. 2007;17(2):140-142. 7. Meehan WP, III, Kids,Sports, and Concussions. (Praeger 2011), p. 118-20. 8. Cohen M. "Neck strengthening exercises could help lessen risk of concussions." Sports Illustrated (September 28, 2012)(http://sportsillustrated.cnn.com/2012/football/ncaa/09/28/concussions-neck-strength-syracuse-eastern-michigan/index.html)(accesssed February 22, 2013). 9. Gregory S. "Neck Strength Predicts Concussion Risk, Study Says" (http://keepingscore.blogs.time.com/2013/02/21/study-neck-strength-predic... )(accessed February 22, 2013), citing Comstock R.D. High School Sports-Related Injury: Recent Trends and Research Findings. Presented at the National Youth Sports Safety Summit, Washington, D.C., February 5, 2013. 14. Cobb BR, Urban JE, Davenport EM, Rowson S, Duma SM, Maldjian JA, Whitlow CT, Powers AK, Stizel JD. Head Impact Exposure in Youth Football: Elementary School Ages 9-12 Years and the Effect of Practice Structure. Ann Biomed Eng ( 2013): DOI: 10.1007/s10439-013-0867-6 (online ahead of print). 18. Delaney JS, Lamfookon C, Bloom GA, Al-Kashmiri A, Correa JA. Why University Athletes Choose Not To Reveal Their Concussion Symptoms During A Practice Or Game. Clin J Sports Med. 2014;0:1-13; doi: 10.1097/JSM.0000000000000112 (published online ahead of print with post-publication corrections, June 19, 2014). Most recently revised and updated September 6, 2014 with the invaluable assistance of MomsTEAM Senior Health & Safety Editor, Lindsey Barton Straus, JD. Because coaches have the strongest influence on a student-athlete's decision to report a concussion, more concussion education of coaches, including the need to report concussions, however, minor, and the creation of a safe reporting environment are critical, experts say, to combating chronic underreporting of concussion.